Purchase online LM386 Audio Amplifier Module with Adjustable gain in India at low cost from DNA Technology, Nashik. Now amplify your audio signals with this low cost audio amplifier module. This is a mono audio amplifier based on the LM386 chip. It is know by various names and descriptions such as “LM386 Audio Amplifier Module 200 Times 5V-12V Input 10K Adjustable Resistance”. 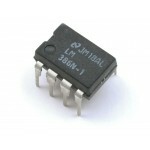 This low voltage audio power amplifier is ideal if you need a small amplifier for your audio experiments and prototypes.